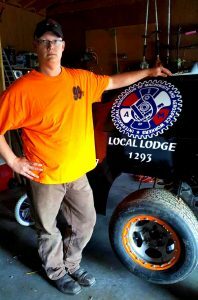 Finding new and unique ways to promote the IAM at times can seem difficult, but leaders of District 6 and Local 1293 have found a fast track to exposure by sponsoring a southern Iowa race car. 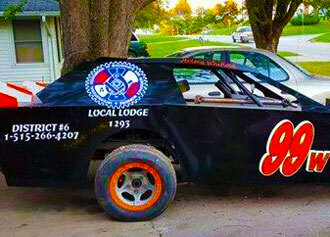 The district and the local both chipped in for the sponsorship, which provides the car with new sheet metal and graphics for the upcoming racing season. The race car, owned and driven by Jeremy Whitlock, will be able to be seen most weekends at International Motor Contest Association-sanctioned races throughout southern Iowa and northern Missouri. Whitlock was an IAM member employed at Performance Pipe for over 15 years before recently leaving for an advancement opportunity with another employer. The 37-year old has been racing in some form or fashion his entire adult life, including several top-five and top-10 finishes. Whitlock attends car shows and plans to bring the car to as many local or district union events as he can. “I’m going to make sure we get them as much exposure as possible,” said Whitlock.